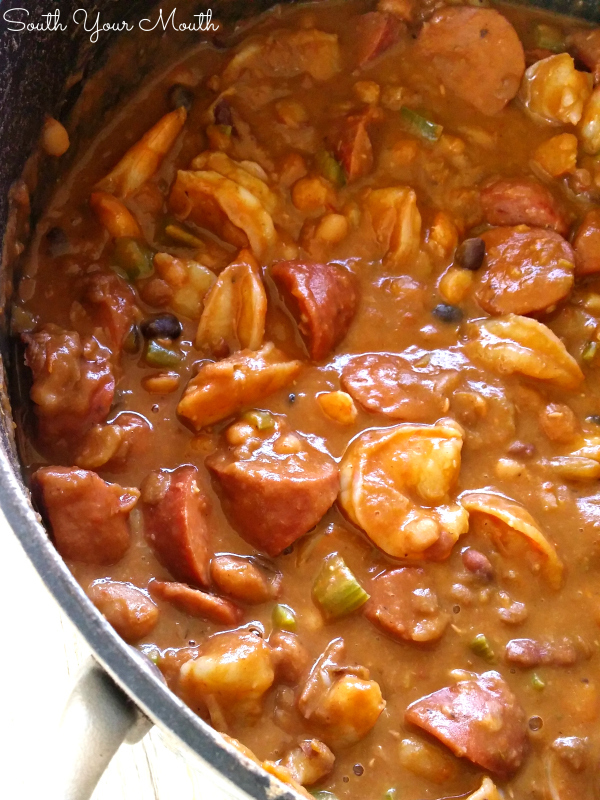 A rich gumbo recipe with Cajun beans chocked full of spicy shrimp and smoky sausage. What the what is bean gumbo?? I know that’s what you’re asking. And maybe even shouting. And maybe you asked it and then spit on the floor like my nanny would have done if someone had implied you could make chicken and dumplin’s with tofu. But it’s a thing! It really is! I had a Red Bean Gumbo in a little dive in Shreveport and it really left an impression on me so I decided to try my own version of it. Y'all know I love me some beans. 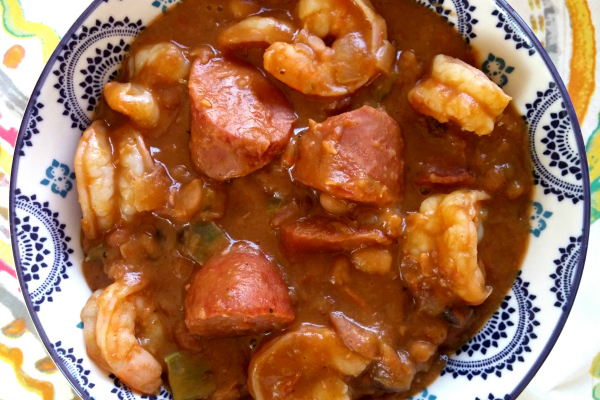 I’d made gumbo before with the traditional dark roux and okra but I would never consider myself an expert on Cajun cuisine so I did a little research and learned some interesting stuff about gumbo. The traditional gumbo ingredients: okra, roux and often filé powder (a spice made from finely ground sassafras leaves) are used to thicken the gumbo. I knew the roux would obviously do this but I didn’t know that’s why okra and filé powder were originally used. On their own, roux (just cooked oil and flour) and okra don’t have a ton of flavor so knowing the beans would naturally thicken things up on their own as well as provide a beautiful dark base, I decided not to use either the roux or the okra (though you could certainly add okra!). 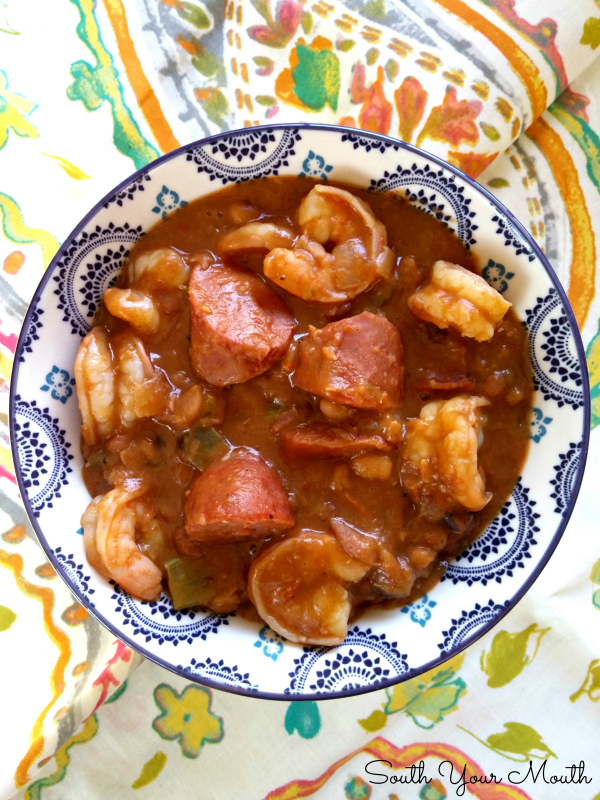 This dish is like all my favorite Cajun dishes in one! I’m not 100% sure exactly which spices are included in the seasoning packet of the Hurst’s Cajun 15-Bean Soup mix but whatever they are, they are PERFECT for this gumbo. I added a little thyme, pepper and garlic for good measure but I probably didn’t even have to do that. Hurst’s has NAILED it on this one. 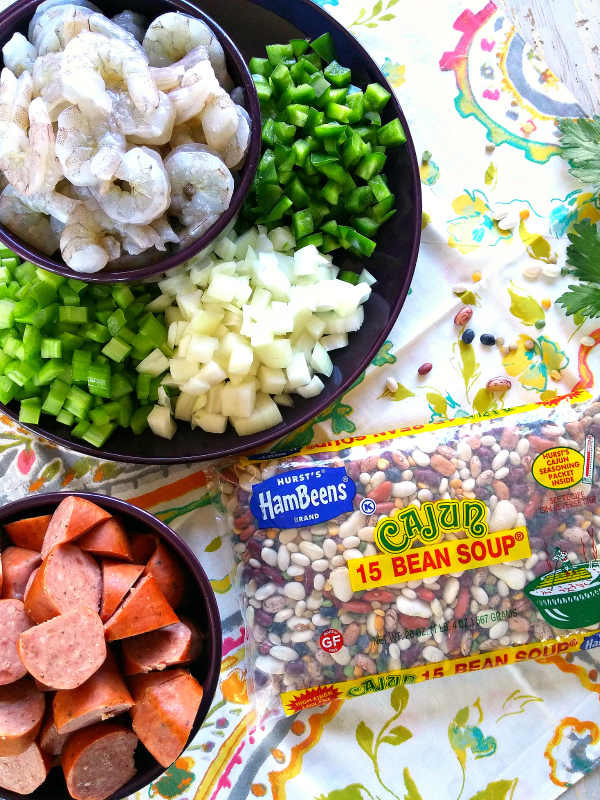 If you can’t find Hurst’s Cajun 15 Bean Soup mix in your local grocery store, ask for it! My grocery store now carries all sorts of products they didn’t have before simply because I asked for them. 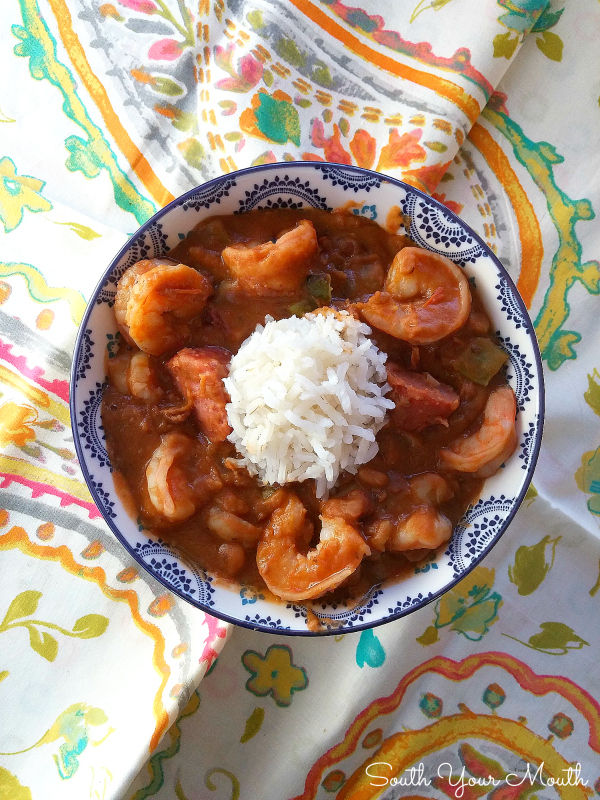 If this sounds good to you, check out this recipe for Slow Cooker Jambalaya too! Combine beans (WITHOUT seasoning packet), water and bay leaf in a large pot or dutch oven then bring to a boil. Reduce heat to medium-low, cover then cook for 4 hours or until beans are tender. Set seasoning packet aside to use later. In a separate skillet, sauté celery, bell pepper and onion until veggies are tender (about 8-10 minutes). Add sautéed veggies, seasoning packet from beans, thyme, pepper, garlic powder, tomatoes (with juice) and sausage to beans, cover pot, then continue cooking for one hour. You can absolutely add okra to this if you’d like. Add it when you add the Holy Trinity. If you want to add okra to this, you know that that means 😉 If you want to add okra, you’ll need to add a little extra water since the okra will thicken things up a bit and this gumbo is already pretty thick. You may wonder why I always tell you to add the seasoning packet later when cooking these beans... it's because salt will make dried beans tough when added too early. 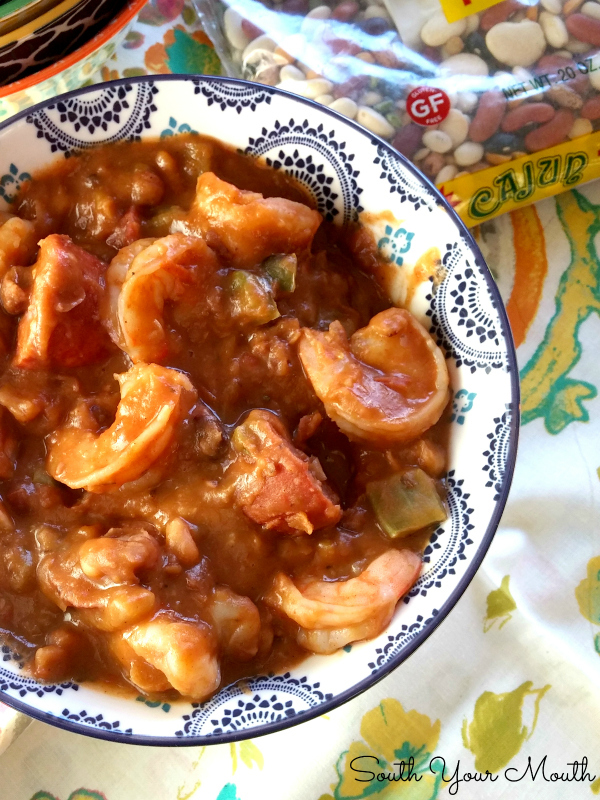 Still don’t believe me about bean gumbo being a thing? Google it! Mandy, where in Shreveport did you have Bean gumbo? We visit there often & are always looking for new foods to try! Will make your version soon. I was a little joint near the Airport (off the main drag where the car rental places are). This was at least 15 years ago, though. I just looked online to see if I could find it and I didn't see anything I thought might be it. I tried this earlier this week -- and it was delicious! It makes a TON of food. We've had leftovers twice. However, I had issues with the beans cooking low and slow for four hours. I couldn't keep the simmer low enough for them not to turn almost to mush after 2ish hours. My stove tends to run a little hot, but I just couldn't get the heat right. My recommendation is keep a close eye on the beans and the heat. Otherwise, all good!! I am so glad you enjoyed it! I ate it for lunch 4 days this week and never got tired of it! By all means, if the beans are tender before the 4 hours are up, move to the next step. 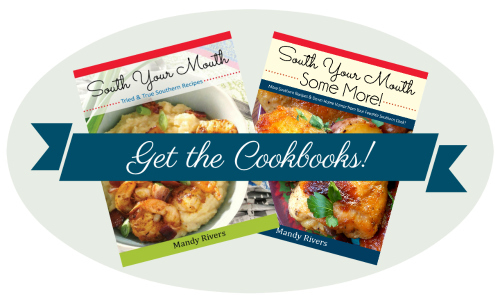 That's the tricky part about writing recipes... everyone's stoves, ovens, crock pots, etc. cook differently. Thanks for taking the time to let me know you liked the recipe! Is there a guesstimate on okra and file powder to keep this from setting up t[ firmly? Are you supposed to soak the beans overnight beforehand? can you add gumbo veggies ? Made this today and its delicious! I served it with toasted French bread slices. Everyone loved it. Will make again. Thanks for the recipe! !